I became a subscriber about four years ago. My first project resulted in a considerable amount of leftover crown but really turned out quite well. Nothing close to professional, of course, but a real confidence builder. Toward the end of the crown project, I began to experience uncomfortable tingling, especially in my right arm. Numbness began to envelop my fingertips and forearms, armpit muscles tightened and never relaxed, extended periods of sleep became a memory. I headed to the various medical facilities, HMO card in hand. I went through enough tests to keep a conversation going for months should I care to do so, and eventually, I learned I had something called “herniated disks 3, 4, and 5 of the cervical spine.” No single accident or impact, just 60 years of wear. As a species, we humans bring a great deal of baggage to the table. We hate, we waste, we destroy, but we also do things that are a bit more constructive. When faced with a problem, we look for and usually find a solution. Not long after my last visit with the doc, I was looking at some equipment at an auction, and when a scissors-lift maintenance platform became available, the wheels in my head began to turn. Now, after considerably more investment than the initial purchase, I am back having a bit of fun working on my house. I can lean back, keeping my head in that “neutral position,” pump myself up so that the ceiling is within arm’s length, sand, paint, and perhaps eventually tackle more complicated projects. —Eugene Cosnahan, Baton Rouge, La. In FHB #170 (“Drawing Board,” pp. 122, 124), Scott Padgett presents some good ideas for “dressing up a deck.” However, a couple of small errors in the article caught my eye. The UBC and the newer IRC require that a 4-in. sphere shall not pass through a railing, not that the railing gap be limited to 4 in. A 4-in. sphere would most certainly pass through any gap of 4 in. as illustrated in the article. In other words, the gap must be less than 4 in. to meet the code. Also, the benches illustrated would need an additional railing beneath them to meet this requirement if they are to be used in place of the required guard railing. Overkill? Perhaps, but it beats redoing the baluster layout if the inspector carries a 4-in. sphere. More important, it avoids the type of child-related head injury the code is intended to prevent. Hold handsaws correctly I learned my basic use of tools many years ago from carpenters from “the old country.” One of the things they taught me was how to hold a handsaw. In the April/May 2005 issue (FHB #170), “Building Skills: Cutting with a handsaw” shows many photos of how not to hold a handsaw, and only one correct one. A handsaw should be held with the forefinger straight in line with the blade and not wrapped around the handle with the rest of the fingers. This way, it is much easier to control the blade for a straight cut. I very much appreciated the latest issue of Fine Homebuilding (FHB #170) because you had articles on two subjects dear to my heart: screened porches and patios. In my view, building a deck on the side of a perfectly good house should be a punishable offense. The best-looking deck on the best-looking house looks like a penguin at the beach to me. No matter how much time and effort you put in, you still wind up with two completely different things that will never look good together. Then there’s the expense. The thought of the money involved in wood alone that will sit outside in all weather (and in New England, we get all weather! ), unprotected, without a roof over it, makes me ill. When I go back through my old collection of Popular Mechanics magazines from the 1960s to the ’70s, I see that the wooden deck appeared as a response to substandard concrete patios that spalled, cracked, and heaved. The wooden deck was like a gift from heaven. Now it seems people think it’s a mandate. “Hey! I just bought a house. Can you build me a deck on it?” I know that decks have kept an awful lot of carpenters in the money, and for that reason only, I can appreciate their existence. But if the deck leads me to hell, the screened porch leads me to heaven! Sun, shade, architecturally appropriate, weatherproof (within reason), bugproof, three-season use, sunny days and rainy days, peaceful hot-weather sleeping at night, the original air conditioner. The article was terrific, and things got better because in the same issue, you had an article on paver patios. I have been preaching concrete patios to people for years, paver or otherwise. With the new admixes available and pumper trucks, you are unlimited in what you can do and where you can do it. The editor replies: You’re going to hate this issue. Let me preface my comments by saying I have been a longtime subscriber of what I believe is a first-class, quality magazine: information galore and great product referral by knowledgeable people. However, I believe you dropped the ball with your article on insulated concrete forms (FHB #170, “A Fast Foundation for an Addition,” pp. 81-85). You missed the opportunity to promote a high-quality, sustainable building system that has been used for years in applications more significant than small basement foundations or in-ground applications. 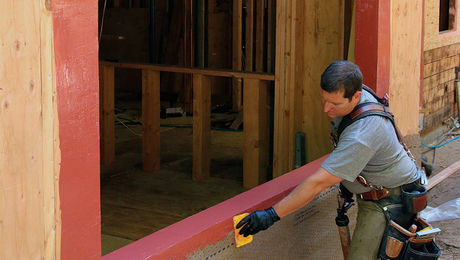 Houses, commercial and government buildings, high-rises, etc., are being built all over the country using ICFs. The benefits of great wall strength, environmentally friendly construction, superior insulating factor, rot- and bug-resistance, lower energy usage, sound-resistance, fire-resistance, and a highly durable structure were ignored. —Gray Rideout, St. Petersburg, Fla. The editor replies: I couldn’t agree more about the benefits of building with insulated concrete forms. But despite the fact that we have featured ICFs in numerous articles over the years, they aren’t catching on as quickly as they should. By publishing Rick Arnold’s account of using ICFs for a small addition, we hoped to encourage more people to give them a try. The building of a new house in 41⁄2 days (“Cross Section,” FHB #169, p. 20) really isn’t anything all that remarkable. In 1983, a team of 350 tradespeople organized by the Building Industry Association of San Diego built a three-bedroom, two-bath house in less than four hours. The house was built from the ground up, including pouring a pad, using conventional framing techniques and without the use of prefab materials. An amazing video documenting this project is available from the Building Industry Association of San Diego (www.biasandiego.org). Although young children are not the intended audience for Fine Homebuilding, mine certainly enjoy looking at the pictures. I like the fact that workers are always demonstrating the safe use of tools and that they are wearing and using protective equipment. However, my 5-year-old was drawn to the close-up photograph in your February/ March 2005 issue (FHB #169, “Tools & Materials,” p. 36) of someone placing the end of a paper clip into an electrical outlet. While readers are obviously aware that the photo was demonstrating a safety plug, prereaders will not necessarily understand that. Keeping our young children safe also includes protecting them from images of others doing something potentially dangerous that they can imitate.